Remember 2018? 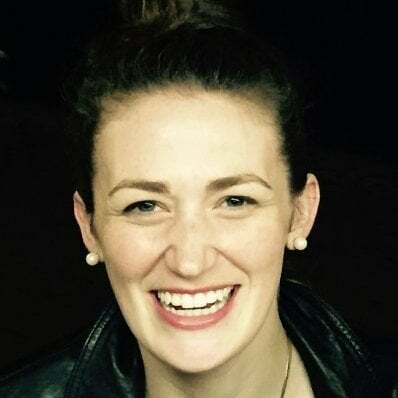 It really wasn’t so long ago that we were chatting in Slack about who heard Yanny and who heard Laurel. Isn’t it fun to think back on how much your team has accomplished together over the past 12 months? Fifty-two percent of all bonuses were interdepartmental and seven percent of bonuses were given by managers to their direct reports. 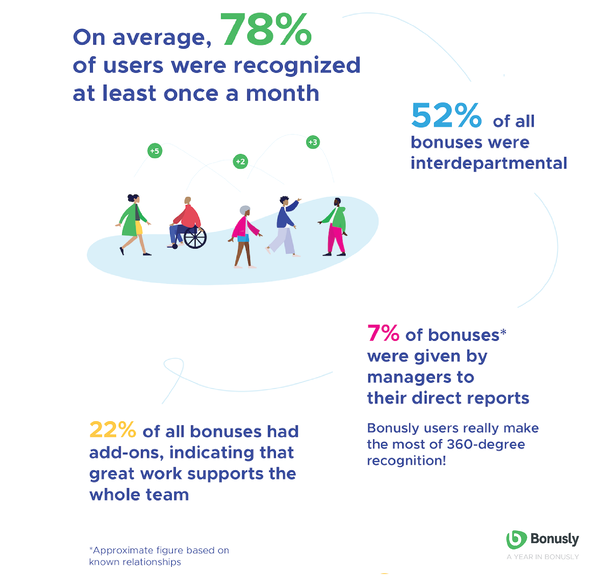 Because Bonusly empowers users to recognize their peers, direct reports, and managers, employee recognition isn't limited to top-down positive feedback. 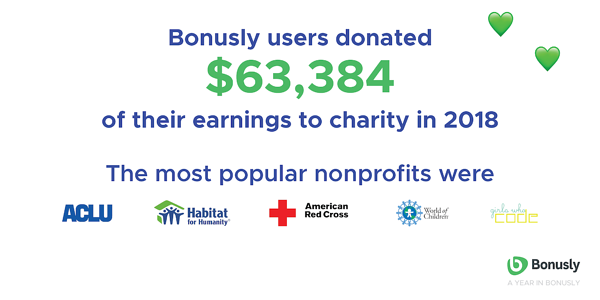 Almost one in five bonuses had add-ons, which indicates that the impact of great work extends far beyond the person giving the recognition. Like Jay-Z and Beyoncé, Bonusly went on a world tour in 2018. 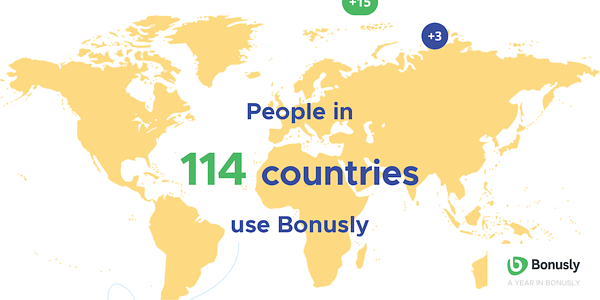 Bonusly users can be found in 114 countries. The majority of our customers (60%) use Bonusly in multiple locations and nearly a third of our customers use Bonusly in multiple countries. Because recognition in Bonusly is directly tied to company core values, we can easily track which values are being invoked most often. 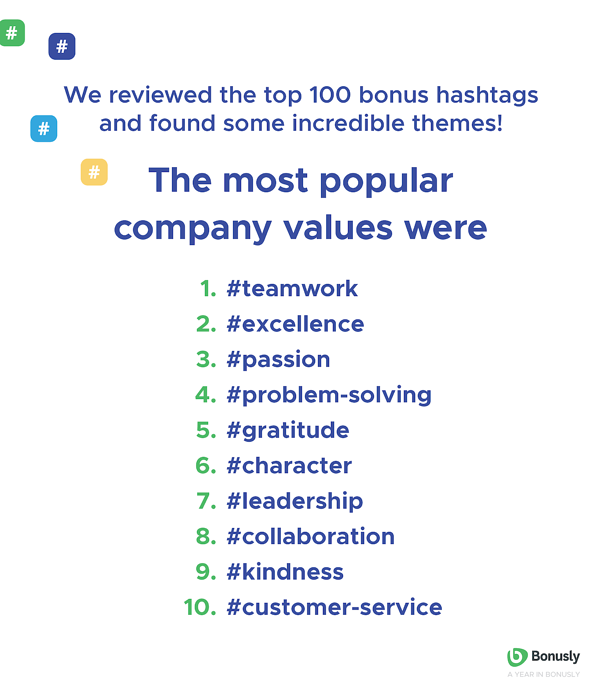 We were curious how much overlap there was between companies, so we reviewed the 100 most-used bonus hashtags and found some really exciting trends. 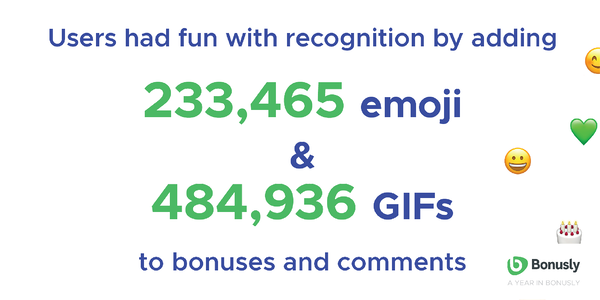 It should come as no surprise that our users' GIF game was strong in 2018: Bonusly users added 484,936 GIFs to bonuses and comments. They also added 233,465 emoji, using 💚, ☺️, 😄, 🎂, and 🎈 most often. Seventy-five percent of our customers integrate Bonusly with their chat tools. 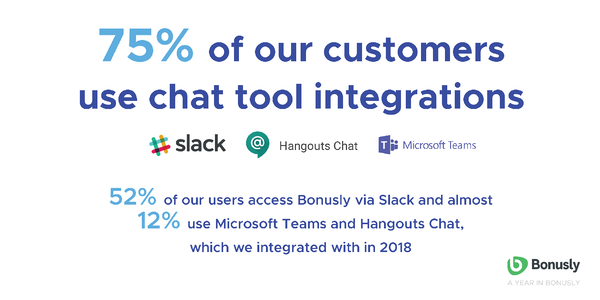 Fifty-two percent use Slack, and almost 12% use Microsoft Teams and Hangouts Chat. We added 57 new rewards to our default Reward Catalog and users redeemed their earnings for a total of 356 different brands. Amazon, PayPal, Walmart, and Starbucks were in the top 5 but a Bonusly-exclusive reward also made the cut! 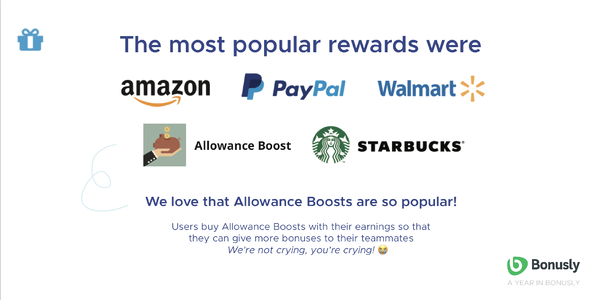 Allowance Boosts, which users can buy with their own earnings in order to give more bonuses to their teammates, were the fourth most popular reward in 2018. Our customers got pretty creative with custom rewards, which accounted for 5% of all redemptions. 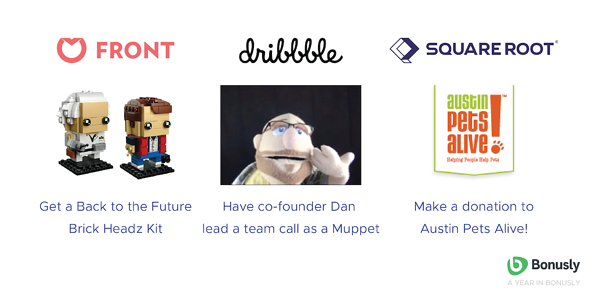 Front, Dribbble, and Square Root had a few of our favorites, offering a Back to the Future Brick Headz Kit, a co-founder leading a team call as a Muppet, and a donation to a local animal shelter, respectively. Check out the full PDF report and if you want to share it on social, be sure to include the hashtag #AYearInBonusly. Now, will one of the Bonusly users who redeemed their earnings for an Applebee's gift card take me out to dinner? All this data is making me hungry!